I’ll start off saying that I’m not a huge fan of new games journalism. Sure, I read Gamespite as if it were the word of the Christ reborn, but it’s more for entertainment purposes. If I want to know if a game might interest me, it’s probably the last place I’d go. Most of the time I get no idea from their articles whether the game is worth playing or not. It’s not that I think new games journalism is bad, I just think it’s a little pretentious to take games so seriously. They’re just for fun, after all. So then the question would be, as it were, why exactly am I throwing my hat into the ring and trying it out? For one, I think I’m probably going to do a really bad job. If I were to submit this article to Parish, he’d probably turn it down and say it’s too much like a standard review. But I have been thinking along the NGJ lines while coming up with things to say about Nuts & Bolts, and I suppose it’s worth a try, if only to keep things a smidgen fresher around this dusty old corner of the intertubes. That said, I’ve linked a few other non-standard game reviews on the “related” section of the navi bar. There’s a short description of how I feel each fits under the banner of new games journalism in the hover text. Also, the 2007 Vitrual Console Wishlist is linked, but that’s just because it features Banjo-Kazooie. So now that I’ve already gone and broken the fourth wall and stated exactly what my intention here is, I suppose I should wrap up this introduction of sorts and get on with the article. Can you all be real good pals and forget that these last couple paragraphs happened once your eyes drift across that separator line below? Thanks. I really appreciate it. Makes the whole thing seem a little more legit. Banjo-Kazooie is not a popular franchise by any stretch. Not with gamers anyway. I know my girlfriend likes it, but the only thing she’s played in the last God-knows-how-long that doesn’t involve a plastic guitar is Trauma Center, and she gave up on that shortly after she lost her first patient. And I mean that as in the first patient she’d ever treated. Pressing on, gamers tend to look upon Rare’s Mario clone with a burning hatred that is not totally undeserved. The first game in the series was a very basic platformer that basically just had you collect a plethora of objects. It goes without saying that the less important doodads would be laying out for anyone to see, but even the Jiggies (equivalent to Mario’s power stars) would occasionally just be lying there for even the most witless of player to scoop up with no effort. The sequel that appeared a couple years later, Banjo-Tooie, didn’t have a much brighter light cast upon it. It abolished the Effortless Jiggy and made players work a little bit harder for that golden treasure, but at the same time at least doubled the number of trivial whatsits you needed to collect. I’m sure that at the time, people thought both games were upstanding shows in a sea of terrible Mario wannbes, but over time, that lesser-of-two-evils respect faded and people realized just what a cheap hackjob these games were. Of course I still look upon them with an air of pleasant memories, but that doesn’t change the fact that they’re kinda half-assed. To be blunt, the less said about Grunty’s Revenge, the better. But times have changed, and it’s been nearly a decade since we’ve seen the bear and bird in anything more than retro webpages. Fortunately for all parties involved, time has been kind to Banjo and Kazooie, even though the opening of the game would lead you to believe otherwise. Which is a point of note in itself; the game is constantly poking fun at its heritage and all gaming tropes that have been called out as stale and thoughtless. Nearly every main character balks at having to collect something, and the writers took every chance they could get to rip on having to complete arbitrary tasks for seemingly worthless prizes. In fact, the first achievement you will get is titled “Pointless Collector”, after a scripted race to see who can collect more golden thingamabobs. Since the writers are complaining about collecting, there’s obviously still a large collecting element to the game. Jiggies are still the number one goal, but each and every one has a challenge associated with it. From simple races to protecting landmarks to defeating a number of enemies, every piece of gold has its price. The widely-loathed musical notes have returned as well, but only as a simple unit of currency, making collecting them completely optional. There is still a set number on each stage, but they’re also handed out liberally for almost every task you complete, so you could theoretically make it through the entire game and buy everything without picking up a single static stage note. Besides the Jiggies and notes, there are also Jinjo tokens to be earned. They are won exactly like Jiggies, but are, much like the notes, completely optional. They’re used at the bingo hall, where you are rewarded notes and vehicle parts for filling in rows and columns on the bingo board. Lastly are vehicle parts, and we’ll go over those later. That brings our total of collectibles up to four. Four. Three of which are entirely unnecessary. Over the limitless number of things you needed to pick up in Banjo-Tooie, I’d say that’s one Hell of an improvement. So if the game isn’t about collecting copious amounts of knick-knacks, then what is left? Well friends and relations, that’s a question I’m glad you may have asked. This is where those vehicle parts come in. See, the game doesn’t work anything like Banjos before. There are no moves to learn, no platforming to be done. No, no. This game is all about driving. And flying. And driving, uh, boats. Boating? 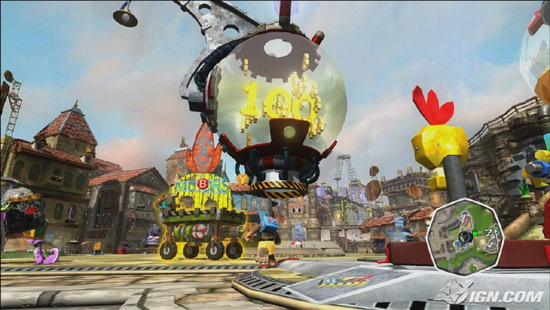 This time around, Banjo can run and jump to his heart’s content, but the game was designed specifically with vehicles in mind. And the best part is that you, the player, get to create each and every one of those vehicles. This creates not only gigantice game worlds, but also very open worlds and even better, a ton of room to experiment with ways to overcome the many challenges the game puts you up against. The hub world is the only exception, since you’re only allowed to drive a basic shopping cart-like machine, but there are still opportunities to press on and get places you shouldn’t be. In the early game, there are slopes that neither Banjo on foot nor the simple cart can scale, but with some clever use of the protruding pieces of scenery (windowsills, lamps, signposts, etc), you can reach most of the available area before you even enter the first game world. If you thought sequence breaking in Metroid was exciting, you’ll most definitely get a kick out of exploring bits of Showdown Town that you aren’t yet meant to be in. And then you’ll venture into the first level and all restrictions will melt away. Early on you won’t be able to make much more than simple car- and bike-styled vehicles, but once you find even one propeller, the worlds are yours to explore as openly as you want, and there is plenty to explore. 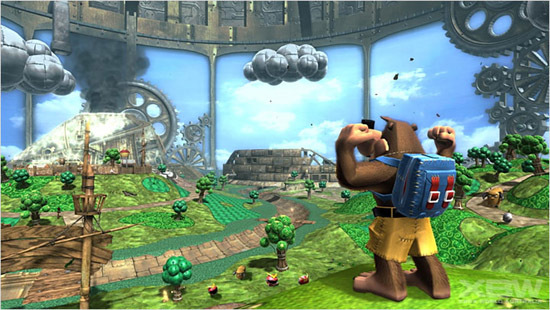 Since the worlds are contained, it’s not exactly open-world play as in a sandbox game, but the levels are many times bigger than anything seen in previous Banjo titles. The fact that there are so many ways to see each world adds to the value as well. If you want to cruise around in a car, that’s cool. Feel like taking to the skies in a plane or helicopter? Go for it! Or maybe you’d prefer the challenge of scaling the tallest peaks on foot. Why not? The world is your oyster, and you’re truly able to to do anything you want exactly as you see fit. Now the best part of this completely open game design is that you can also tackle the game’s many challenges however you like. The game invites you to try out some suggested ways of doing things early on by forcing you to use pre-built vehicles once in a while, but less than halfway through, they become very scarce and it’s up to the player to decide how they want to solve the problem. Most races, for instance, take place on the ground, but if you’re having trouble driving the specific course, why not take to the skies instead? Races are marked by compulsory rings to pass through, but a low-flying plane would not only soar past any competition, but also nullify any issue of minor enemies in the way and terrain becomes almost negligible. The game will never directly penalize you for using a vehicle they didn’t intend to be used in the mission, and you’ll get an extra sense of accomplishment for thinking outside the box. But there’s got to be more than races, right? Of course! There are a wide variety of mission types, and seeing them through in your own way is as rewarding as anything else. For example, a later mission in the first world sees a statue under attack by airborne foes, with the gamer left to try to defend it for two minutes. A gamer’s first instinct would be to build a flying warship to take out the invaders, and if your contraption is built the right way and you’re skilled enough, I’d say go for it. I, on the other hand, found that there were far too many enemies to be able to complete the mission. I tried and failed many times before genius struck. I went back to the garage and tried something completely different. I figured that if I couldn’t stop the enemies from destroying the statue, then maybe taking them down was the wrong approach. So I build what could be best described as a flying house with no floor. It was two layers thick, powered by all the engines and propellers that I had available, and I flew it over to ground zero and landed it right over top of the statue. I sat there for two minutes as my assailants shot at and dive-bombed the small fortress, and laughed heartily when the time expired and my statue was left without a single scratch. Another example is one mission where I was given the task to transport as many coconuts as I could from the top of a tower on one side of the island to the coconut farm where they would be sucked up into some kind of coconut repository. You are given three minutes. I should also mention that in this game you can pick up almost any object in the scenery, and that is basically the only thing you can accomplish on foot. At first I tried using a helicopter to winch over one nut at a time, and as you may imagine, it went very poorly. After that, I put together a large flying monstrosity composed of a giant tray and a trash bin, thinking that I could load it up with nuts and fly them over in two or three trips. Putting the nuts on and taking them off one by one was very time-consuming, and I could have passed, but just by the skin of my teeth. And then I crashed into the coconut-sucker and it detached from the rest of the machinery. I had another brainstorm, and on the next attempt, I broke of the coconut-sucker and flew it over to the tower. From there, I picked it up, and simply swept it over the area, sucking up every single nut in no time flat. I had more than two minutes to spare by the time I was done. One final example is from one of the many Jinjo challenges. This particular Jinjo turned into a huge ball and asked me to ram into him and fling him as far as I could. He would give me a token if I made him go a predetermined distance. So I tried over and over with many different vehicles built for speed or power, trying different angles and tactics, but I could never seem to get him far enough. There would always be a hill to slow him or an obstacle to outright stop him, and to get a perfectly aimed shot was near impossible. When I did get the perfect shot, it still wasn’t sufficient. By that time I was bashing my head against an ottoman in frustration, trying to come up with a solution. It was then that I build a super fast plane with a carrying tray. 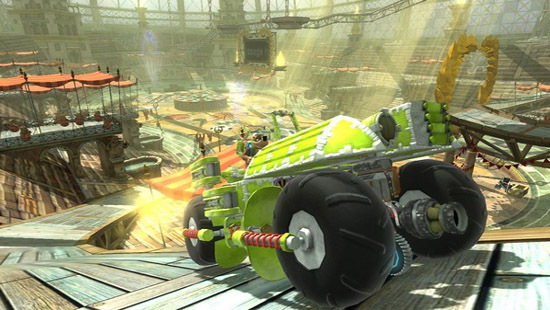 I put the Jinjo-ball in the tray, took off, and while my engines cut out once I passed the allowed field of play, it still drifted far further than I needed, and I got up and did a little celebratory dance for finally finding a loophole. Banjo-Kazooie: Nuts & Bolts is a fantastic game, and that’s probably because aside from the characters, it’s nothing like the previous games in the series. It gives the player a true sense of freedom, letting them play the game however they want, building machines of their own design and then tweaking them to get the absolute perfect performance for whatever given task they may be facing. It often suggests the obvious way, holding the player’s hand for a little while to get them started, but then lets them fly free to make their own decisions on how to play. It encourages players to think outside the box by making some challenges frusrtatingly difficult (but still possible) to do though by following the most logical course of action. It’s an incredibly engaging – if at times infuriating – experience that I’m glad I didn’t skip out on. 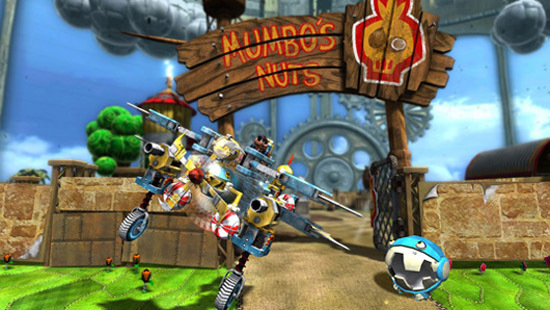 Nuts & Bolts is a game that genuinely lets the player take control, and I think that’s the kind of thing that truly defines a next-generation gaming experience. That and it’s gobs of fun. Oh, and the music is totally solid, as to be expected, even if it is all completely recycled from previous games. The Banjoland medley? Nostalgically awesome. But we all already knew that anything Robin Beanland does is terrific, right?